Looking for deals in Honolulu? Featuring an outdoor swimming pool and a fitness center, Real Select Vacations at The Ritz-Carlton Residences, Waikiki Beach is located in Honolulu, a 5-minute walk from Royal Hawaiian Shopping... Clean and bright luxurious wooden furnishing as expected of the Ritz Carlton Residences. Spacious room with balcony and ocean view. Great amenities, equipped with in room kitchen and laundry. Good spa and pool facilities. Staffs are very welcoming. 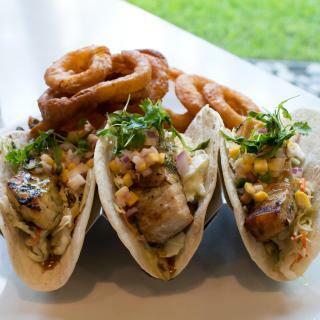 Located between the Hawaii Convention Center and Ala Moana Shopping Center, Ala Moana Hotel features 2 restaurants on site. Free WiFi is included in all guest rooms. The front desk staff were very friendly and helpful. Featuring a 280,000 gallon, two-story saltwater Oceanarium in the middle of the lobby filled with a large variety of colorful native Hawaiian reef fishes, ‘Alohilani Resort Waikiki Beach offers beach... Easy to access the hotel from the parking garage. Located within an 8-minute walk of Royal Hawaiian Theater Legends in Concert Waikiki, Waikiki Beachcomber by Outrigger in Honolulu features a number of amenities including an outdoor swimming pool and... All staff we encountered with were very friendly. Located across from upscale shopping on Luxury Row, Aqua Oasis is 2 minutes’ walk to the Royal Hawaiian Center and 5 minutes' walk to Waikiki Beach. The location is great to the hustle and bustle of Waikiki. Located across from the Ala Wai Canal, this boutique hotel offers free daily continental breakfast and free Wi-Fi. The Royal Hawaiian Shopping Center is less than a 10-minute walk away. The staff that makes a big impact they are both friendly and considerate. Hotel La Croix Waikiki offers unobstructed views of the ocean, mountains, palm trees,or Waikiki city lights in every guest room. Private parking is available on site. Great location. Very close to the shops and beach. White Sands Hotel Honolulu is located 2 blocks from Waikiki Beach and the Royal Hawaiian Shopping Center. It offers an outdoor pool surrounded by a garden. Huge king size bed. Loved coffee machine in the room. Great pool which was always kept clean. Featuring an outdoor swimming pool, Royal Grove Waikiki is set in Honolulu. Loved the vintage look. Absolutely no cockroaches and the kitchenette was fully stocked . Featuring an outdoor pool and hot tub, the OHANA Waikiki Malia by Outrigger is 5 minutes’ walk from luxury shopping at Kalakaua Avenue. Waikiki Beach is 5 minutes’ walk away. Location is very handy to all the ammenities & the Beach. Only 3 minutes’ walk from Kuhio Beach, this fully furnished and self-catering studio apartment is located in the Waikiki District of Honolulu. Loved having kitchen, making my own food was huge benefit as I have a picky 3 year old to feed. Located within 5 minutes' walk of Waikiki Beach and the Royal Hawaiian Center, The Laylow, Autograph Collection is a mid-century modern hotel located 3 mi from Diamond Head Crater Hike. Great food and drinks. Staff were super helpful. Located 1 block from Waikiki Beach, Queen Kapiolani Hotel features panoramic views of Diamond Head from the outdoor pool and sun terrace. The location is handy, a one block walk to the waterfront. The hotel is decorated very nicely. Featuring 2 exotic pools and beautiful views of the ocean, The Modern Honolulu stands next to the sands of Waikiki Beach. A world-class restaurant and 3 bars are also available. GOOD DOWNTOWN LOCATION, BRIGHT AIRY FEEL TO THE ROOM, EXCELLENT DINING AND RELAXING AREAS. Nestled just steps from Waikiki Beach, Embassy Suites by Hilton Waikiki Beach Walk is an all-suite resort located just off the main strip of Kalakaua Avenue. Staff were always helpful and friendly. Located at the west-end of Waikiki at the edge of Ala Wai Harbor, Ilikai Lite offers a year-round outdoor pool and sundeck, a 24-hour fitness facility, and 2 on-site restaurants popular for dining... It’s nice, convenient, and great price. Across from Waikiki Beach and offering stunning views of Diamond Head and the Pacific Ocean, this 100% non-smoking hotel offers a rooftop swimming pool and terrace with ocean views. The hotel rooms were recently updated. They look very nice & CLEAN! The beds are comfy. 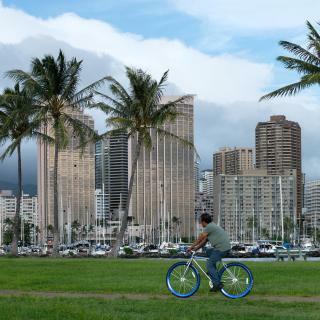 Which neighborhood is the best one to stay at in Honolulu? Downtown Honolulu, Kahala, and Waikiki are popular with other travelers visiting Honolulu. Which hotels in Honolulu have nice views? Prince Waikiki, The Ritz-Carlton Residences, Waikiki Beach Hotel, and Hotel LaCroix Waikiki got great room view-related reviews from travelers in Honolulu. Which hotels in Honolulu are good for families? Many families visiting Honolulu loved staying at Prince Waikiki, Real Select Vacations at The Ritz-Carlton Residences, Waikiki Beach, and The Ritz-Carlton Residences, Waikiki Beach Hotel. Which hotels are the best ones to stay at in Honolulu? Prince Waikiki, Real Select Vacations at The Ritz-Carlton Residences, Waikiki Beach, and The Surfjack Hotel & Swim Club are some of the popular hotels in Honolulu. Which hotels in Honolulu offer an especially good breakfast? For hotels in Honolulu that serve highly-rated breakfasts, try Waikiki Marina Resort at the Ilikai, The Modern Honolulu, and Hotel LaCroix Waikiki. How much does it cost to stay in a hotel in Honolulu? On average, 3-star hotels in Honolulu cost £156 per night, and 4-star hotels in Honolulu are £263 per night. If you're looking for something really special, a 5-star hotel in Honolulu can be found for £463 per night, on average (based on Booking.com prices). 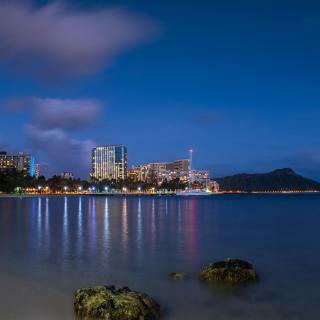 What are the best hotels in Honolulu near Waikiki Beach? Some of the best hotels in Honolulu near Waikiki Beach include Jenny's Pineapple Cottage, Halekulani and Hokulani Waikiki by Hilton Grand Vacations Club. How much is a hotel in Honolulu for tonight? On average, it costs £192 per night to book a 3-star hotel in Honolulu for tonight. You'll pay around £254 if you choose to stay in a 4-star hotel tonight, while a 5-star hotel in Honolulu will cost around £388, on average (based on Booking.com prices). How much is a hotel in Honolulu for this weekend? The average price per night for a 3-star hotel in Honolulu this weekend is £380 or, for a 4-star hotel, £523. Looking for something even fancier? 5-star hotels in Honolulu for this weekend cost around £816 per night, on average (based on Booking.com prices). Which hotels in Honolulu are good for couples? These hotels in Honolulu are highly rated by couples: Real Select Vacations at The Ritz-Carlton Residences, Waikiki Beach, Queen Kapiolani Hotel, and The Surfjack Hotel & Swim Club. What are the best hotels in Honolulu near Honolulu Airport? Travelers who stayed in Honolulu near Honolulu Airport (HNL) have said good things about Airport Honolulu Hotel, Best Western The Plaza Hotel - Free Breakfast, and Pacific Marina Inn. Standing proudly on the island of Oahu in the Pacific Ocean, Honolulu is the Hawaiian capital, meaning "a sheltered bay." Spreading along the white sandy beaches and supported by the strong back of the volcanic mountains, it's a real island paradise. 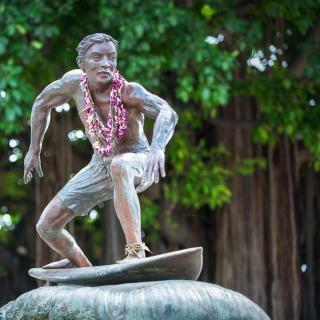 Honolulu's most popular and famous district, Waikiki, features the stunning Waikiki Beach decorated with hundreds of surfboards, palms and lounge chairs. It’s also a center for the city’s nightlife and shopping, especially along Kalakaua and Kuhio Avenues. As the most popular activities in Honolulu include surfing, snorkeling, canoeing and other water sports, it's no surprise the city has a number of sandy beaches. Try Hanauma Bay, a crescent-shaped beach with rolling, green hills behind it. 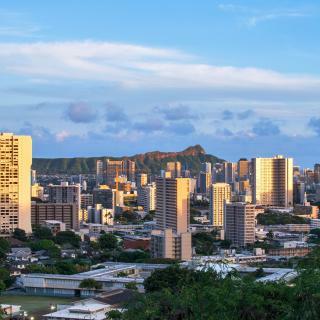 For fans of hiking and exploring, nature awaits at Diamond Head Mountain, a volcanic tuff cone where you can admire the panoramic view of the city. There is also the Bishop Museum with the world’s largest collection of Hawaiian and Pacific artifacts and the Waikiki Aquarium with over 490 species of marine fauna and flora. From hotels near Honolulu International Airport to hotels near the beach, Booking.com has plenty of properties, from cheap to luxury, for your Honolulu trip. I would have like to have more local or hawaiian food. I would have like to have more local or hawaiian food. I think they had too many chain resturants and not enough hawaiian or island food. I would definately recommend the cultural center, and beaches are great. Better beaches on the north shore. Busy place, lots of out of country tourists but lets face it everyone wants to vacation here! Dukes has awesome food and service! Hula Grill was great also. Love all the shopping everywhere. Cheesecake Factory was a delight with awesome food and excellent service. Our waiter made our wedding supper a great memory we will always treasure! The free Trolley was fun and the trolley driver was very informative on the culture and history of the island.. he even sang Hawaiian songs to us! So fun!! Zoo was ok nothing spectacular, should of seen more on the island but we were busy with wedding.So will just have to go back and see more! Heaps to see and do. Heaps to see and do. Mainly ate at some of the smaller businesses located around Waikiki where we were staying. Using the buses is easier for getting around places rather than the trolleys. Full day bus passes are $5-50 and you can get on and off as often as you like and travel different routes. Pearl Harbour - allow all day for this. Hawaii Five O Tour, Snorkelling, Helicopter & Island tours, Diamond Head Crater walk, Museums. Not as scenic and quiet as the other islands. Not as scenic and quiet as the other islands. But this island is cheaper, and there so much to see and do in and around Waikiki. 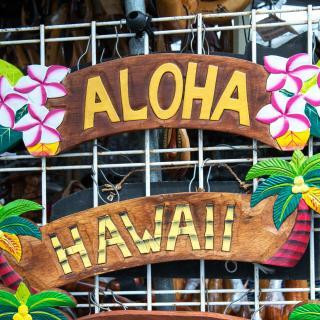 Shopping was great, especially at the Aloha Stadium Flea Market. Be sure to see the various free Hula Show entertainment that is available in Waikiki. I also recommend buying tickets for the Waikiki Trolley, and using that as a daily base to explore and learn about Hawaii. 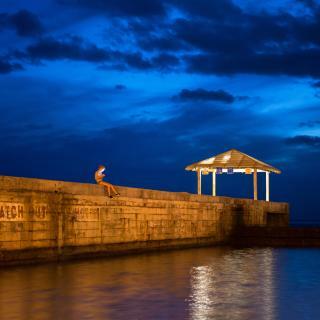 Honolulu has something for everyone - beaches, walking trails, history and just relaxation. It is very easy to get around using the local buses which take you to the same places as the organised tours, but you are able to do it in your own time. We ate at the Hilton Hawaiian Resort. There are many restaurants to choose from. We loved the Tapa Bar. Great music every night and very friendly staff. Able to order bar food. Although I've lost all my interest in the United States after 9/11, this time I had to visit Honolulu as a business trip for the first time. And the result was hopelessly horrible, the worst place I've ever been in the last decade. In a week of the itinerary I experienced a credit card fraud at hotel reception amounts to around 500 EUR, and again a few days after I came across a robbery in a public park on Sunday afternoon, lost things, injured and hospitalized. Overall high prices, homeless people, littered and aged cityscapes were also problematic. But some locals were kind and helpful. Great customer service; the front desk manager offered to change our room after we raised a concern that there were noises coming from the roof (we were on the top floor). At breakfast, they made a mistake with my order and the wait staff offered my partner a complimentary breakfast which was nice of her. I love the coastal vibe of the room which was calming and relaxing. And a proper shower cubicle, not a shower over bath which was the case in 2 other hotels we stayed in. Overall a great stay, I recommend The Modern Honolulu. First time visiting Hawaii, Ramada Plaza offered everything we wanted, one bus stop from Ala Mona centre the biggest shopping complex in town, easy access to Waikiki beach with buses running every 10 minutes and transport pretty much to any part of the island at your door step. Best all you don’t have to break wallet for the stay unlike many surrounding hotels like Hilton Village, Double Tree, or Ilikai which could easily double the rates. Rooms are clean and staff very helpful and friendly. Highly recommended. This is a small hotel in comparison to the mega resorts around Waikiki but what I liked most was the distance from the beach (and the view from my room). They also provide a free shuttle to the Ala Moana Mall which is absolute massive. In the lobby there is a small sandwich shop, an ABC store next door and a restaurant so you really do not have to go far to get what you need. The Honolulu Zoo is directly across the road as well. Location right on sea front. The room was amazing, like best room I’ve stayed in. Large comfy king bed, seating area, large balcony and a smart toilet. Also we had a free mai tai on arrival and $50 hotel credit which we used on breakfast. The next day we had breakfast at Eggs and Things across the road, so much cheaper. The beach across the road is very shallow with small waves, no chairs so take towels. The breakfast was good and had a nice selection. The server in the breakfast room was very attentive and kind. The convenience store on the first floor in the lobby is a nice touch. The location is both good and bad. Good for proximity to the airport if you are just travelling through. However, there are much more convenient options if you are coming to Hawaii for the beaches or tourism. Location is perfect. Staff is very helpful. Room was clean and the hotel has a lot of amenities such as a gym and outdoor pool. Free wifi in the room and daily free glass of POG juice at the pool. Truly feel that this is the best Hilton location in Honolulu. Not as crowded as the Hilton Hawaiian Village, so the staff has more time to interact with the guests. Felt very welcome there. This was our first visit to Hawaii and we stayed at Aqua Palms. It was in a great location with access to the beach only a short walk away. Can not say enough about the amazing staff. They were so friendly and helpful with any question we had. Our room was really clean with one of the most comfortable beds we have had staying in hotels. Very quiet. Definitely recommend this property. I loved that it was right on the beach away from the hustle and bustle in Waikiki. We stayed at 6 different places in Hawaii and it was nice to end the last 2 nights right on the beach in Waikiki. It’s amazing to have private beach access, and a nice view of the city and the mountains too. Beds were comfy, deffs not my last time here, will be back. I always stay here when in transit through Honolulu. It’s close to the airport and away from downtown crowds. Its clean and comfortable. It’s not what most people picture when they are thinking about Hawaii, and that’s what I like about it. Absolutely loved this hotel, perfect location, recently renovated rooms and lobby, and to top it off the staff were all amazing. Would definitely stay at the Waikiki Beachcomber the next time we’re in Hawaii. Good location close to the centre of town. Did what I needed... reasonably cheap for an overnight stopover in Hawaii. Great if youre travelling in a group and can get the same room together. The hotel was nicely renovated. I like the decor in the public area, modern with Hawaiian vibe. The staff at the bell desk are friendly and especially willing to help. I liked my stay a lot. Hawaii Hilton exceeded my expectations. Waikiki beach was great. Going from room to beach in 2 minutes was pretty great too. Good location, friendly staff, spacious clean room with excellent amount of toiletries provided. So far the best hotel for me in Hawaii. Good value Chinese restaurant on site...the only BYO I saw in Hawaii! Free airport shuttle 24 hr service. Beautiful and relaxed hotel just on the beach. Excellent breakfast. 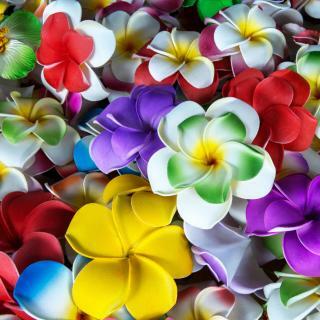 Nice staff - we were met with a lei. Being in Hawaii. Near beach. The oceanfront room was magnificent! And the staff was super! I would definitely stay there again! Friendly people, definitely would come here again.